Note: this post contains some affiliate links. This means that in some cases if you purchase items, I might receive a commission. See disclosure page for more details. And, commission or not, this list only includes items that I think are great! 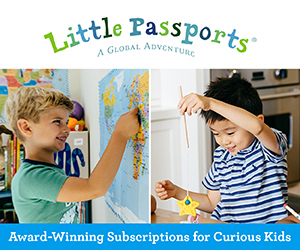 Little Passports is a monthly subscription service that exposes kids to different places, cultures, and ideas through monthly packages with toys and activities. The boxes teach kids about geography, science, and world cultures AND are really fun and interactive. There are different options for various age groups, 3 and up, and you can search for the right subscription by either age or interest (curious kids, nature lovers, STEM, art lovers.) It's a fun package to receive (particularly in the winter months when you're looking for fresh activities) and it helps foster curious and adventurous minds. I have long had the travel bug and enjoy Little Passports because it helps pass that bug on! I like Melissa and Doug for art supplies because there's lots of variety and they're all high quality. Plus, they're easily organized on the site - you can search by basic supplies, projects, crafts, easels, drawing, etc. depending on what you're looking for. And, today - November 27 - you can get free shipping! Kids love a trip to the movies, particularly when they get to schedule it and run the show. To make this gift more exciting, wrap the gift card in a popcorn box with some candy and popcorn so there's something to open and play with on Christmas. You can even schedule an at-home movie on Christmas night and use the popcorn box for some movie theater-style popcorn. Not only do LEGOs do great things for kids' minds and confidence, but they provide hours of focused, entertainment. Depending on the set, they're perfect for independent play or for a project to do together. Plus, there is something for every age range and interest, from 2- adult. My only real gripe about LEGOs is that I feel a little overwhelmed by the choices, but the LEGO shop has good filtering options (theme, age, categories, etc. ), so it's manageable. Everyone will be getting a LEGO set this year at our house - and if anyone's still shopping for me, the Hogwart's Castle, pictured above, is a good option! Save Up to 30%. See what's on sale! Last year, my daughter got a Baskin-Robbins gift card for her Birthday. I was curious how she would react to it (she doesn't have a great sense of money yet, so I wasn't sure she'd appreciate what she was getting.) But, she LOVED it. She kept it in a special spot, and we periodically scheduled family outings to the ice cream shop, where she proudly presented the card and treated us all to ice cream. It was a good learning experience for her, resulted in a number of fun family outings for us, and, obviously, was delicious. It's now part of our go-to gift lineup. And, to make it a little more interactive on Christmas day, you can give the gift card and a small wallet or purse. For younger kids, this will add a whole new level of fun as they store the card in the wallet, practice putting it in and pulling it out, set up their own shop at home, etc. Also, this gift is really easy to purchase, wrap, travel with, and/or ship. When in doubt, get books. Everybody uses books, they don't add clutter, they can be used over and over again, and they're the best. To add a little extra to your book selections this year, try doing a book box subscription, where kids will periodically get a box of books in the mail. You can have the first box arrive for Christmas or you can give them a single book on Christmas and spread out the excitement of the boxes. These subscriptions give kids the fun of getting a package in the mail and the excitement of new books to read. It's a great way to encourage a love of reading and books and to, for lack of a better way to say it, give a gift that keeps on giving. These are the gift ideas we've had good experiences with. Good luck with your shopping this season and please share any other gifts that you recommend and think should be included in this list!